The soap opera didn't start on television! 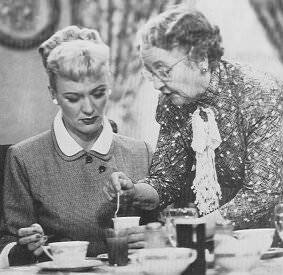 The Story of Aunt Mary, a radio soap opera broadcast in the 1940s, is one of the best known examples of the radio soap. Jane Morgan voiced the character of Mary Lane, a plucky country matriarch who offers downhome wisdom and farmstead breakfasts. Jane Webb plays her live-in niece, Peggy, and Fred Howard plays Lefty Larkin, a farmhand with a mysterious past. Love triangles, unwed mothers, jealousy, failed marriages: all your classic soap staples are here, adorned with charming details of World War II-era life. Aunt Mary's bucolic hometown of Wakefield bears a remarkable resemblance to Mayberry, USA. Broadcasting fifteen minute shows, five days a week, this soap opera was a morning staple in homes around the country, with almost 500 episodes sent out on the airwaves for over a decade. Although I have yet to play the entire series, I am very pleased with both the price and quality to date.